Thus have Prince William & Catherine been joined in Holy Matrimony in London’s Westminster Abbey with the eyes of England and the world upon them. And as with each of these generational royal weddings – 1947 Elizabeth and Philip, 1981 Charles and Diana – the good and worthy media has informed us that the throngs lining the processional route from the Abbey to Buckingham Palace swelled to, verily, one million strong to witness the drenched opulence of it all. 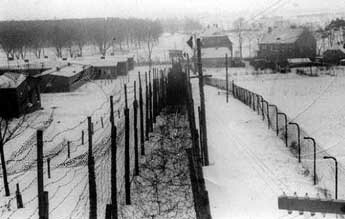 The drab blanket of night had already folded over the bleak Polish countryside when Colonel Paul Goode walked into one of the prison barracks of Oflag 64 in Szubin, Poland at 5 p.m. on the afternoon of January 20, 1945. Since his capture in the Po Valley north of Florence, Italy the previous September, U.S. Army Lieutenant Isham Reavis had been moved several times to different POW camps. Now, as the Soviet Red Army maintained its relentless advance pushing Germany toward ultimate defeat, Reavis and approximately 1300 American POWs held in Oflag 64 were to begin a march meant to take them 400 miles from Szubin to Luckenwalde, Germany south of Berlin. It would prove to be a harrowing 39-day journey that fewer than 500 would complete. Now official, a Norwegian national tribute to Grete Waitz will be held at Bislett Stadium in Oslo on Wednesday May 11 at 5PM. Grete’s husband Jack has met with, among others, a representative from the Prime Minister’s office. The Tribute, will be open for everybody, and then there will be a reception, also at Bislett, afterwards. Arguably, the greatest female distance runner in history with five world cross country titles, a World Championships Marathon gold medal (1983) and Olympic silver (1984) to go along with nine New York City, and two London Marathon titles, and four marathon world records, Grete Waitz died last Monday night in her sleep in her hometown of Oslo at age 57 after battling cancer for six years. As a girl, Grete Anderson both trained and raced at Bislett Stadium winning numerous national championships as a junior and senior level competitor. Twice she set world records on the historic oval. First in June 1975 she ran 8:46.6 for 3000 meters. One year later she lowered the mark to 8:45.4. Her 1500 (4:00.55) and 3000 meter (8:31.75) times remain Norwegian national records. A bronze statue of Grete (pictured above) was erected in 1984 to commemorate what was a still-building legacy of greatness. Following Boston’s monumental 115th running last Monday, the talk once again has turned to the cold vivisection of the finishing times rather than the hot-blooded competition that produced them. The question is simple, was Kenyan Geoffrey Mutai’s 2:03:02 not just the fastest time ever run over 26.2 miles of roadway, but, in fact, a marathon world record? The general consensus is NO, Boston was wind-aided on April 18th with a steady 15-20 mph push the entire way. Add in the net elevation drop of 459 feet from Hopkinton to Boston, and the combination makes the venerable old course ineligible for record recognition. She sailed out of Antwerp on Tuesday, December 4, 1945. Everything she owned she carried in pigskin leather bag: two dresses from her time in Nuremberg, a sweater, some underwear, one pair of shoes, and the little French-English dictionary she kept from her escape out of Krakow. With the clean sea breeze brushing along her brow, Bisia Reavis stood alone along the rail of the Belgian Unity, a Liberty Class freighter bound for New York City. Just one month past her 24th birthday, she looked back at the only world she had ever known as it slipped from view. Ahead awaited the American husband she had met and married just ten months ago in her native Poland. Behind lay an old way of life still smoldering in ruins. No longer the headstrong schoolgirl who thought the war would be a big adventure, Bisia’s six years of fighting under occupation had shattered the world she had inherited, so, too, many of its people. Some, like Bisia, now found themselves scattering like wind-blown seeds to far away lands with only their memories and dreams to replant. April 18, 2011 will forever be remembered as one of the most bittersweet in running history. After a magical morning when the running gods blessed us with a once-in-a-generation Boston Marathon, they took back much more with the passing of Grete Waitz, a once-in-a-lifetime hero. The great Norwegian track, cross country, and marathon champion succumbed to cancer late Monday night at her home in Oslo, Norway, ending a courageous six-year battle and a life of 57 too short years. Grete died as she had lived, with dignity, grace, and the love of her family and friends. Those of us fortunate enough to call her a friend knew of the improbability of her prognosis when cancer was first discovered in 2005. Yet this most private of people who won the hearts of the most public of cities, New York City, maintained the incomparable grace that made her much more than a championship runner. Sport is a meritocracy. Thus each game must be fortunate in its champions. In the late 1970s, the growing sport of marathoning could not have chosen a more perfect candidate to flower than the 27 year-old school teacher from Oslo. At the time, Grete was on the cusp of retirement, figuring she had run out the string on what had already been a remarkable career. After five world cross country titles and two track Olympics – but no distance beyond 3000 meters available – Grete only reluctantly accepted race director Fred Lebow’s invitation to the 1978 New York City Marathon because husband/coach Jack convinced her it would make for a nice second honeymoon. I was fortunate enough to be the finish line announcer that fall day in the Big Apple. As the women’s race entered its final stages word was relayed to me from the lead vehicle that bib #1173 was winning by a wide margin. I paged through my entry list, but found no such number.